More progress on the prototype DRO. Buttons are now working – Axis reset and Measurement toggle. Also added a startup config option to allow default metric/imperial measurement and reverse axis options. lines in case anyone whats to use standard 7-segment displays via MAX7219/MAX7221 drivers. 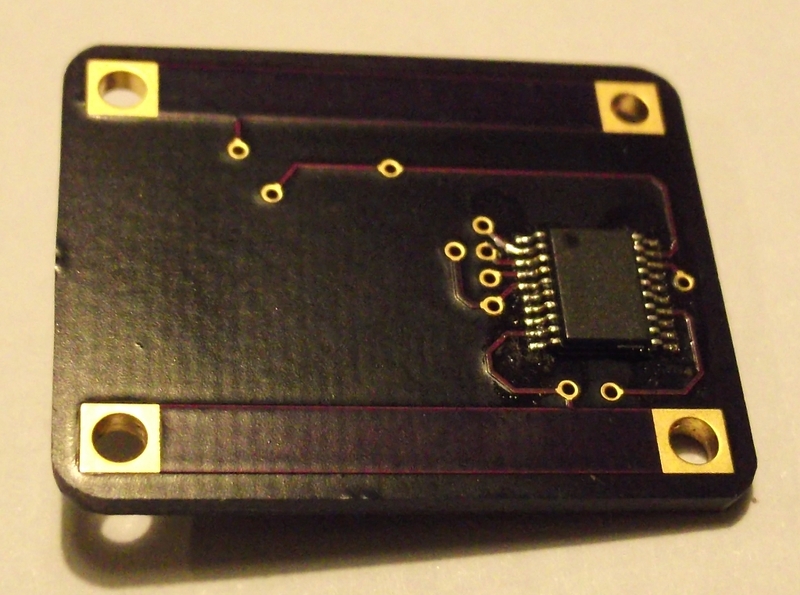 The board uses a surface mount TQFP ATMEGA328P. ICP and FTDI headers provided for Bootloader/Prog. I managed to load the bootloader using either an UNO as a programmer or using a cheap USBASP programmer board. Both worked. The board is treated as a Arduino Uno and must be set as this in the Arduino ADE for either bootloading or programming via FTDI. Font still needs updating for the OLED display. Sensors have been mounted in the aluminium cases I made earlier. I have potted these in epoxy resin and added armoured cable. 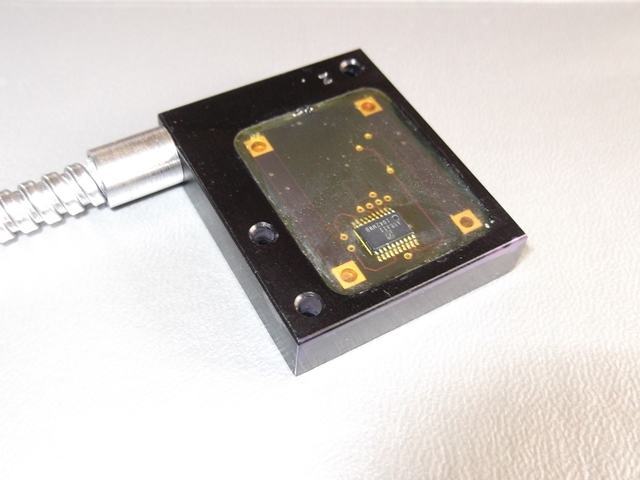 The top of the AS5311 sensor sits above the resin and casing by a small amount. My small Taig mill will be the first recipient of the DRO. I’ve spent a few days making the mounting brackets for this. Here’s the Z Axis sensor mounted and ready to go. 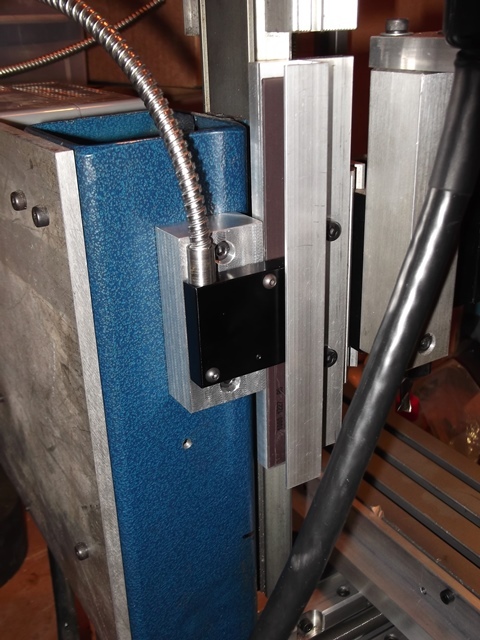 The magnetic strip is mounted in a 16mm square aluminium U channel. I’m in the process of mounting the X and Y sensors. Next step is to mount the display board. For this I plan to mill the case from a solid block of one inch thick aluminium. The prototype encoder PCB has been made and tested with an Arduino Nano. 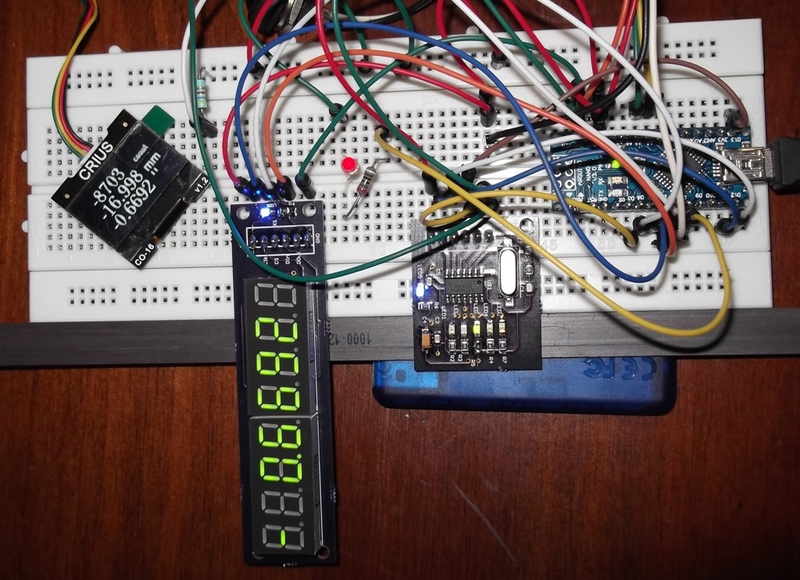 You will notice in the photo that I’m using 7 segment displays and a small OLED display. I plan to support a number of different displays. One version with the ‘traditional’ 7 segment displays and one version with a large OLED display showing all data. I tend to favour the OLED displays. They have low power consumption, fantastic contrast, excellent refresh rate and easy to use. The LED display shown in the photo is connected via SPI. The display board is based on the MAX7221. Current per segment has been limited to less than 5mA per segment since I’m powering it from the USB port. 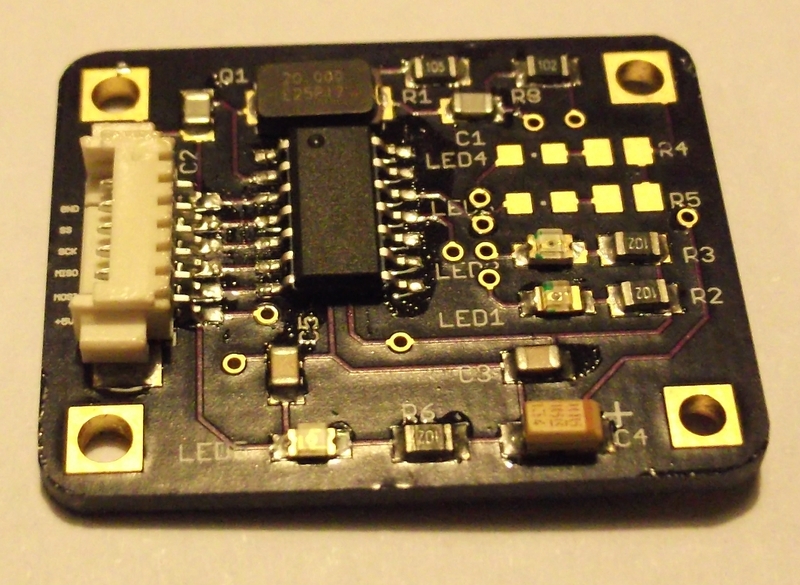 The small 1″ OLED is connected via I2C so only requires two I/O ports on the Arduino. 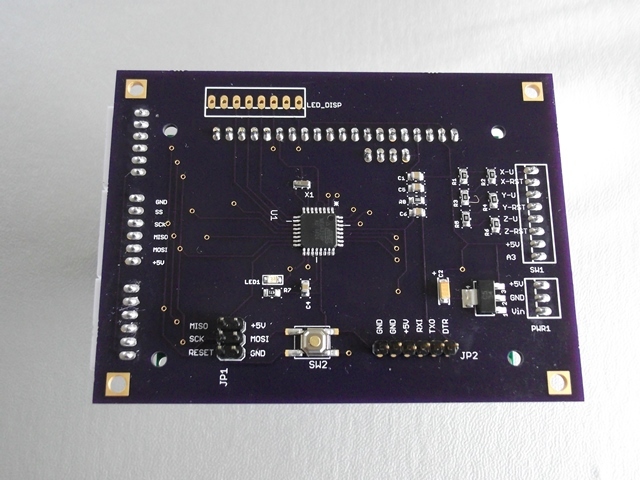 This particular board is labelled ‘CRIUS’ and used on multicopter controller boards commonly available off Ebay for a few bucks. If you buy one of these CRIUS boards, make sure you buy the version 1.2 board. The earlier boards don’t work well with the Arduino without modification. (adding a resistor/capacitor on the reset line). I used the U8glib library for this display. The 300mm magnetic strip for the encoder is visible at the bottom of the breadboard. Code needs to be refined more with X,Y,Z axis and reset/unit switches. Hopefully this will fit in the Arduino ATMega328 code space. 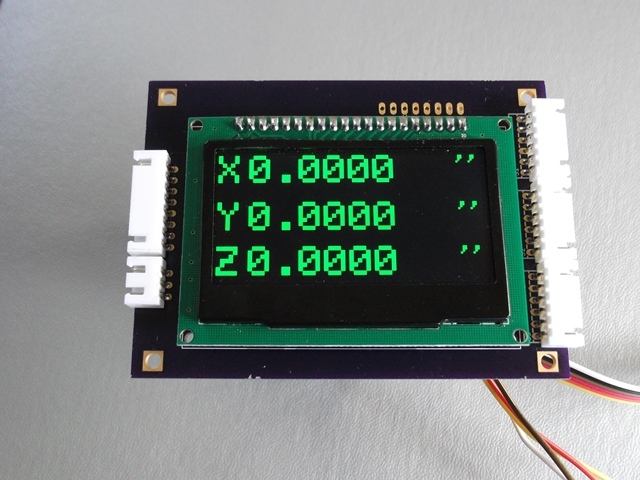 Next prototype will use a 2.4″ green I2C OLED display based on the SSD1305 controller. This display is 128×64 pixel and should be big enough to display all X,Y,Z readings with a metric or imperial unit indicator. Unfortunately this display isn’t current supported by the U8glib library. It is very similar to the SSD1306 based displays so should be easy enough to modify the library. Waiting on a Display PCB to arrive to test this…. I have a few machines in my home workshop. I guess most people like me have found that the cost of the machine is small compared to the accessories you need… So I spend most of my time making accessories. I’d like some digital readouts for my machines. Problem is that they cost lots for lots of machines… Why not make some. How hard can it be? Magnetic scales seem to be the easiest way to go for the serious DIY’er Small in size, scalable to any size simply by cutting the magnetic strip and of course, relatively cheap. 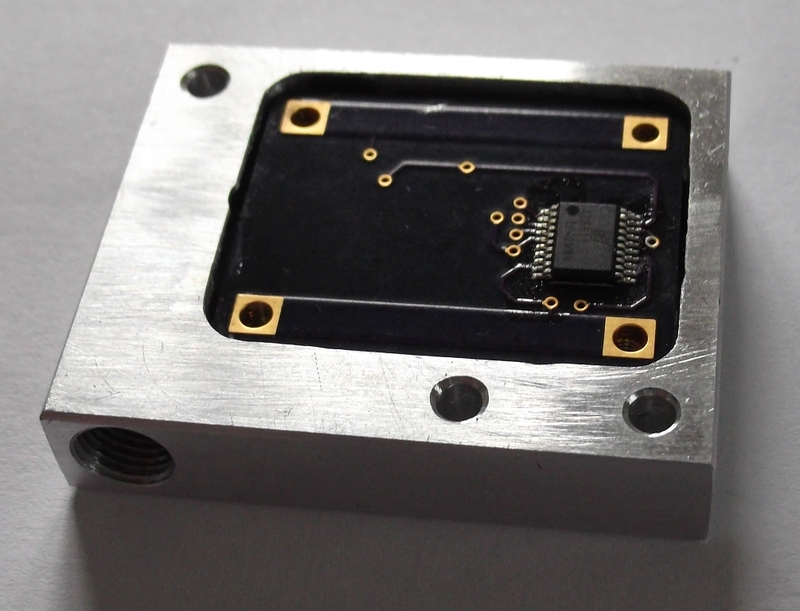 Austrian Micro Systems make a range of linear encoders suitable for this project. I’ve picked the AS5311 device. This device has a resolution of about 0.5um. It also has quadrature output that provides a resolution of 1.95um 1.95um is good enough for me. 0.00195mm So, how am I going to read these devices? The Arduino was my first thought. Cheap and easy to program. The Quadrature output of the AS5311 gives 1024 pulse per 2mm magnetic pole pair. I want my project to have at least 3 axis capacity. I don’t think the Arduino would cope with this on three separate inputs. After some searching for quadrature counters, I came across the LS7366R from LSI. 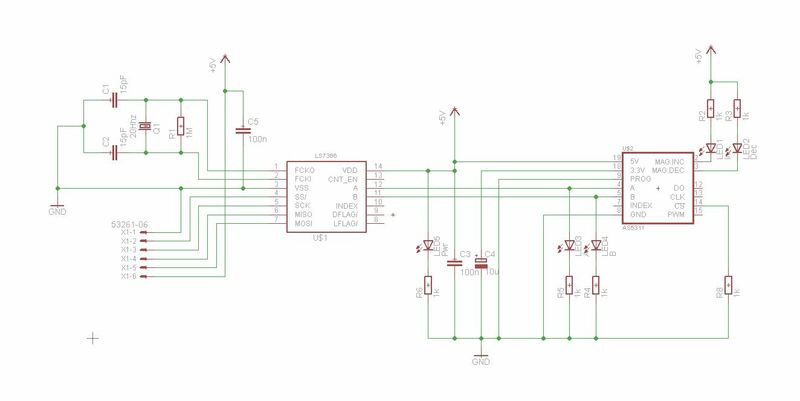 This is a 32bit Quadrature counter with a SPI interface. Perfect. So, my sensor consists on an AS5311 and a LS7366R to count the pulses. Then, it’s just a matter of reading the pulse counter on the LS7366R and displaying the results. This should allow me to use the Arduino to process the counts and drive a display. Here’s my circuit: Circuit board time.